A puzzle/dexterity game about a photon lost inside a quantum computer. Your goal is to guide the photon to the terminal pad after activating eight 1-bit flip-flops. But the photon is very elusive and cannot be directly controlled. And hence you are given a set of block of various types that effect the photon's direction in some way. The game is mainly controlled via mouse. Pick a block type from the menu on the left-hand side and place into the game field using a left mouse button. To delete a placed block, right click on it. If you use touch-pad, you may find left click + Shift or numeric keyboard key more handy. You cannot delete a level block, one that you did not place yourself. 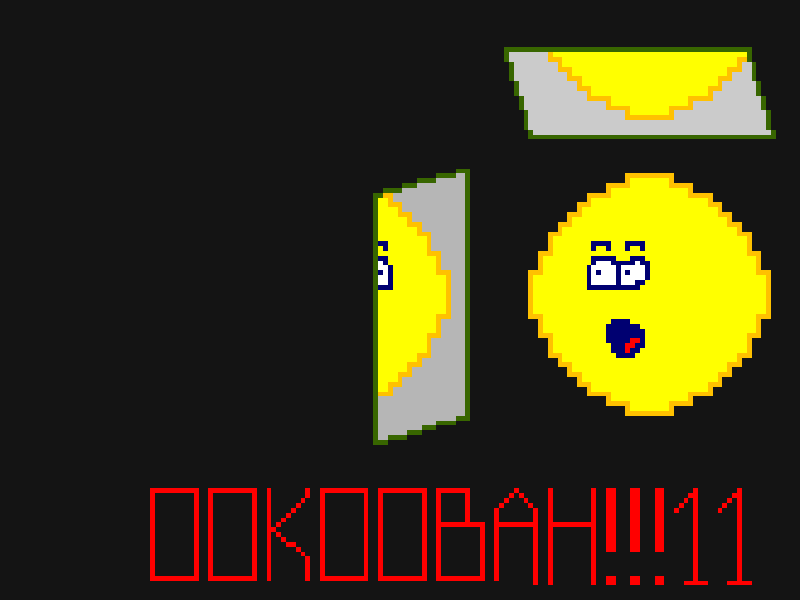 As promised, here is a short screencast of the Ookoobah gameplay: http://youtu.be/aiXntST983E. Version 1.0 was reported to not work on Windows. Meet a fixed version 1.1: https://pyweek.org/media/dl/18/latitude11/ookoobah-1.1.zip. To enable the editor, pass an additional command-line argument specifying the level name. If a level with the given name does not exist, you'll start with an empty grid and could make a level from scratch. If the level exists, you could amend it. Once invoked, you'll find a new item "Edit" in the main menu. That's the editor. and can specify which blocks are locked (level blocks), and which will be moved from the grid to a player's inventory. Some levels have an optional introductory text that is displayed when a player enters a level for the first time. This text is stored in a file $GAME_DIR/data/$LEVEL_NAME.level.txt and may be edited separately. To play your new level, simply pass its name on a command-line as shown above and select "Play" in the main menu. If you want to include your level in the standard series, you'd have to add it to the tuple LEVELS in the file ookoobah/game_mode.py. During the challenge we were very focused on the game itself, and could find time for level creation only on the last day. I should say: coming up with level ideas is hard! 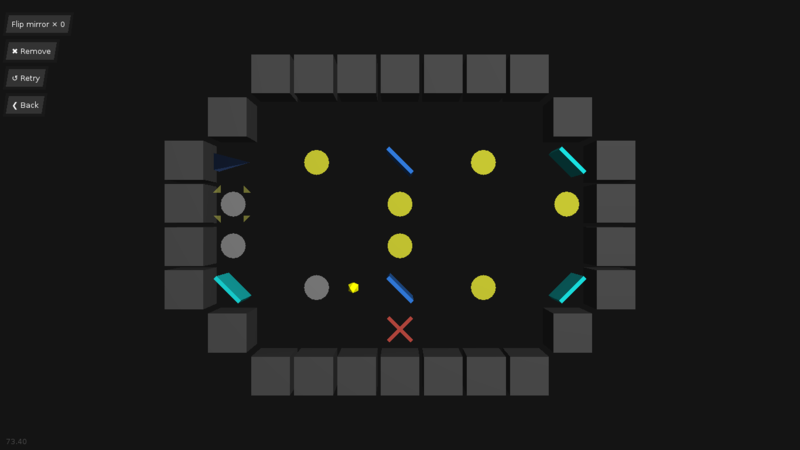 Nevertheless we made 15 levels, including 6 tutorials, which should suffice for starters. But you are absolutely free, even encouraged, to create your own. Please do and share them with everyone. Looking forward to seeing your work! We are glad to present to you our game Oookoobah. It's a puzzle/dexterity game about a photon lost inside a quantum computer. Your goal is to guide the photon to the terminal pad after activating eight 1-bit flip-flops. But the photon is very elusive and cannot be directly controlled. And hence you are given a set of block of various types that effect the photon's direction in some way. 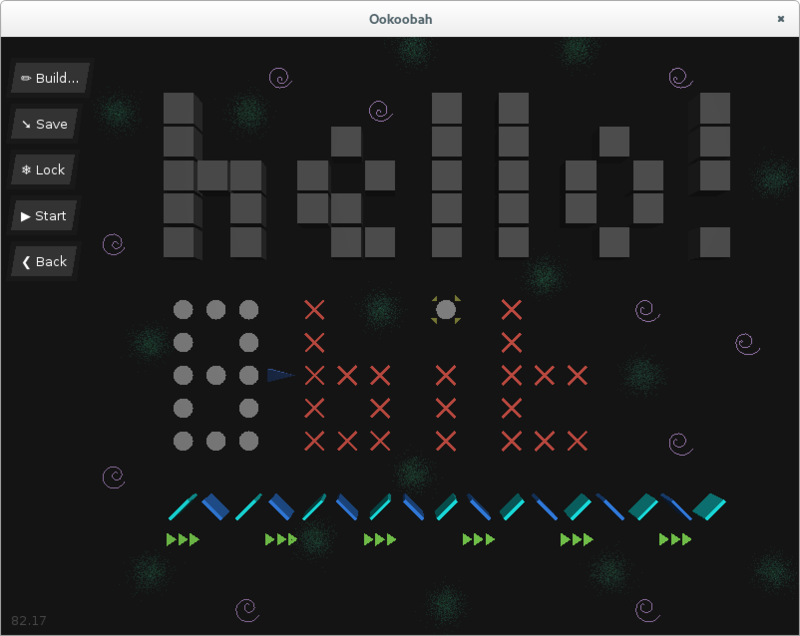 The game was written and tested in Python 2.7 under GNU/Linux and MacOS X. Besides Python core libraries the game depends only on Pyglet, which is already included in the bundle. Unfortunately, we could not test the game under Windows, but it should just work. If you face any problem with running our game, please let us know. The game is mainly controlled via mouse. Pick a block type from the menu on the left-hand side and place into the game field using a left mouse button. To delete a placed block, right click on it. If you use touch-pad, you may find left click + Shift or numeric keyboard key more handy. You cannot delete a level block, such that were not placed yourself. Left mouse button on an empty grid cell Place a selected block on the grid. Left mouse button on a placed block Rotate the block. Left mouse button + Shift; or right mouse button Delete the block. Arrow keys Move the camera around the grid. Mouse wheel Control camera zoom level. Digit keys 1 to 9 Menu item shortcuts. We are the group of three Perl developers, none of which is a gamedev: kent_turbo, mvuets, and che. kent_turbo has been participating in PyWeeks for quite a long time and has got quite a good experience in making games with a help of Python. mvuets has never programmed in Python before, but always wanted to try it out in real, so PyWeeks seemed to be an excellent opportunity. che joined us as he was interested in Python and gamedev. All of us have a full-time job, so we were not able to work on the project full day all the week through. Despite that I think we managed to achieve quite a good result. I personally am very happy! Since the very beginning of the challenge we were using GitHub to coordinate all our code changes. If you are interested, feel free to check it out here: https://github.com/vickenty/ookoobah. We hope you'll enjoy our little pet. Looking forward to hearing feedback from you. P.S. I'll make and upload a demo video of the gameplay once I figure out how to compile and run a screencast software on my laptop q-: Stay tuned.